How Much Will It Cost For New Window Coverings in Your Ardmore, PA Home? Do you want to upgrade the quality of the window coverings in your home but are worried about the cost of the project? There are always expenses with home renovations. Even though you will be spending money, you can be strategic to ensure that you get the best value in the products that you receive. When you are ready to improve the quality of window coverings in your Ardmore, PA home we invite you to contact our team at Blinds and Drapery Showroom. Our team is focused on offering the products that you want at a price that you can afford. We have established strong relationships with high-quality suppliers, making it possible for us to pass those savings onto you. The most important thing that you can do is make sure that you are working with a trusted contractor. Some companies will try to lure you in with low prices, only to surprise you with fees added onto the final bill. At Blinds and Drapery Showroom, we are transparent in our pricing. There aren’t any tricks or gimmicks from our salespeople. We believe that you deserve straightforward information about the products that you are planning to buy. When you are choosing window coverings for your home, it is important to avoid the trap of buying cheap products to save money. It might be tempting to choose the cheapest proposal that comes in. But, you need to compare the value of that proposal with other options that are available. As an example, you might receive a cheap bid from a company, only to discover that they are offering low-quality blinds instead of the shutters that you want. Value is more important than the price tag! If you want to improve the quality and appearance of your home, then sometimes it makes sense to spend a little more so that you can improve the final results. Consider the margins of your buying decision to see how much more you can get by spending just a little more. Also, it is always important to talk to your windows contractor about the final cost of the project. They might be providing you with details about the cost of materials while omitting details about the installation fees. 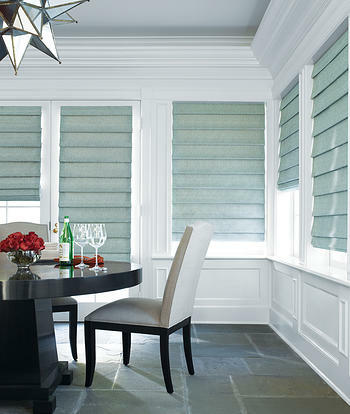 At Blinds and Drapery Showroom, we will provide you with the final cost of the project before starting the work. This price will give you peace of mind by knowing that the actual bottom-line cost is within your budget. Another consideration is the quality of the materials and products that you are buying. If you decide to cut corners right now and choose low-quality blinds or shades, then it is likely that those products will need to be replaced again in the future. Look for materials that are built to last, especially if you will be moving the window coverings up and down on a daily basis. Wear and tear are normal for most products, but durable materials will continue looking good for many years. At Blinds and Drapery Showroom, we want to be sure that you are happy with your window coverings for many years. We will talk to you about the pros and cons of the different materials that are offered, helping you to make your decision. Our team is always focused on open communication with our customers. We know that customer relationships are the foundation of a successful company.As a result, we seek to build solution relationships with each person. When you talk to our company, you can rest assured to know that you will receive the direct attention that you deserve. We always offer a free consultation for each new client. During this appointment, you will have the opportunity to learn more about the products that are offered by our company. Additionally, you will have time to ask questions and explore the features that will be best for your home. Our team is always available to make recommendations based on your individual needs. We want to help you create the home of your dreams! You can hand-pick the colors, materials, and design features that will put a smile on your face each day. These custom design features make it easy for you to create the perfect window coverings to match your needs.